IllumiNotUs ? - "The Illuminati" ...... Left-over Social Predators .... or; "something else"? Decide for Yourself ! The "New World Order" .... "The Illuminati" ... "The Globalists".... "The Socialists" .... "The One World Government" ("them", not you); Co-Opting terms like Unity, Peace, Harmony & "Cumbayah" & All Coming Soon, to a Planet Near (& Dear) To You !?! Intro: The Illuminati, "They Who Would Be The Kings of the Earth"
"Who Survived The Great Flood? An Unbroken Link & "The Right To Rule"? Dead Presidents Whistleblowers & The Legend of "The Lone Nut"
The "Illuminatus".... the "Illumined Ones" ... the ones "smarter than the rest of us" .... the ones that believe they are entitled to re-organize the world for Their convenience and tell the rest of us (the unwashed masses, aka "the rabble") "what to do" ... and ... "When & How to do it" ... all in the name of "Social Justice" (Communism - Marxism - Fascism - Feudalism .... which ever one gets the job done). [1-4] - Suppose It Wasn't Just "Noah" Who Survived The Flood? Whatever the degree of civilization before the "flood"
One group escaped the deluge & fled to Mars or hovered in a craft of their own making ... waited it all out, but; decided to return and re-establish their dominion only to find there were Survivors who wouldn't be to happy to meet up with some of the ones that had"left them to die" in the Flood/Disaster. One group went underground; and stayed there, but; later decided it was safe enough, and; wanted back on the surface. One extra-terrestrial group that had bio-engineered humans; decided to save some of their experiments ... and let them re-populate the Earth, but; they bred like rabbits, things got out of hand, and so a sort of trickle-down government was established to keep them all in line ... with varying success. Just some really greedy, selfish, Elitist-Mentality humans; "unable to work & play well with others" (but good at finance & business) got very rich & powerful and decided they didn't want to have to hobnob with the rest of humanity and so decided to order the world according to limit their (The Elitists) exposure the "unwashed masses" ... yet, still maintain them as a labor force. Once Slavery was outlawed ... they then it became necessary to begin herding the masses together in the name of Social Justice (under tight control of a privileged class of managers or bosses) as it had become apparent, there were too many humans on the planet to control by force alone. Sub-Category 1: Stressing the Occult (hidden knowledge from the Past) and Scientific Advancement (Eugenics borrowed from simpatico Americans, rocket research, & genetic engineering.... An Elite Governing Entity Emerged as the Nazi Party in Germany & attempted to rule the world under Hitler & the Third Reich. Sub-Category 4: Sumerian-area cave survivors needed to re-build the world to once again have access to advanced technology in order to achieve goals thwarted by the "Great Flood". How do you rule the world without men & materials under your control? So ... they began to rebuild the world; searching for a people to build up into a governing body through which they could control & manipulate the planet for their own ends. Maybe they want to regain access to space travel? Maybe they were stranded here with "know how" ... but; "no way"? At different points in history, "charismatic leaders" have emerged seeking to "conquer the World". Known by various "empire" names: Muslim Empire, Roman Empire, Mongol Empire, Nazi Empire, Napoleonic Empire, Viking Empire. From Genghis Kahn to Attilla the Hun - from Alexander the Great to Adolph Hitler ... everybody has sought to rule the world. Maybe it wasn't all their own idea in the first place? "I have been convinced that we, as an Order, have come under the power of some very evil occult Order, profoundly versed in science, both occult and otherwise, though not infallible, their methods being black magic, that is to say, electromagnetic power, hypnotism, and powerful suggestion. We are convinced that the Order is being controlled by some Sun Order, after the nature of the Illuminati, if not by that Order itself. We see our edifice ... crumbling and covering the ground with ruins, we see the destruction that our hands no longer arrest ... a great sect arose, which taking for its motto the good and the happiness of man, worked in the darkness of the conspiracy to make the happiness of humanity a prey for itself. They began by casting odium on religion ... Their masters had nothing less in view than the thrones of the earth, and the governments of the nations was to be directed by their nocturnal clubs ... the misuse of our order ... has produced all the political and moral troubles with which the world is filled today ... we must from this moment dissolve the whole Order". - Freemasonry was successfully infiltrated and had been taken over since (at least) the Council of Wilhelmsbad, Germany, in 1780. At The Congress of Wilhelmsbad (July 16th to August 29th, 1781 - attended by Masons, Martinistes, and representatives from other secret organizations from Europe, America and Asia), an "understanding" was reached between the Masons and the Illuminati. Then, on December 20th of 1781... an Order was proposed to add the Illuminati organization to the first three degrees of Masonry. 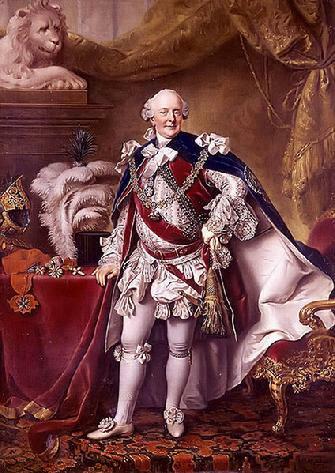 Comte de Virieu, a Mason from the Martiniste lodge at Lyons, upon his return home when questioned about the Congress said: "I will not confide [the details] to you. I can only tell you that all this is very much more serious than you think. The conspiracy which is being woven is so well thought out, that it will be, so to speak, impossible for the Monarchy and the Church to escape it." "The great strength of our Order lies in its concealment; let it never appear in any place in its own name, but always covered by another name, and another occupation. None is fitter than the three lower degrees of Free Masonry; the public is accustomed to it, expects little from it, and therefore takes little notice of it." 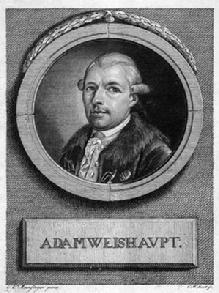 The Bavarian government disbanded the Illuminati in 1786 & Weishaupt died in 1830. Mazzini - "Originator of The Mafia"
 - The Illuminati re-grouped; & Guiseppe Mazzini, an Italian patriot and revolutionary leader, was appointed head of the Illuminati in 1834. A 33rd degree Mason, he joined a secret organization known as the "Carbonari" ... whose stated goal (in 1818): "Our final aim is that of Voltaire and of the French Revolution -- the complete annihilation of Catholicism, and ultimately all Christianity." 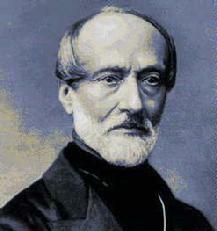 Mazzini was committed to the cause of Italian unity & became known as the 'Evil Genius of Italy'. He then tried to carry on the activities of Illuminati through the Alta Vendita Lodge, the highest lodge of the Carbonari. In 1860, Giuseppe Mazzini had formed an organization called the 'Oblonica,' a name derived from the Latin 'obelus', which means: "I beckon with a spit (dagger)." Within this group, he established an inner circle called The Mafia. It was to this band of criminals that Mazzini gave the name 'Mafia', which was an acronym for Mazzini, Autorizza, Furti, Incendi, and Avvelengmenti. Known as the Mafiosi, they were authorized by Mazzini to commit thefts, arson and murder. It was this organization that came to America during the 1890's with the beginning of Italian immigration. - Adolf Hitler (20 April 1889 – 30 April 1945 & Chancellor of Germany from 1933 to 1945): After writing Mein Kampf; Hitler wrote a 2nd Book. Its title? "A New World Order" . The Survivors of the Last "Cataclysm"
Hence ... the Invention of .... "MONEY"
The Year? 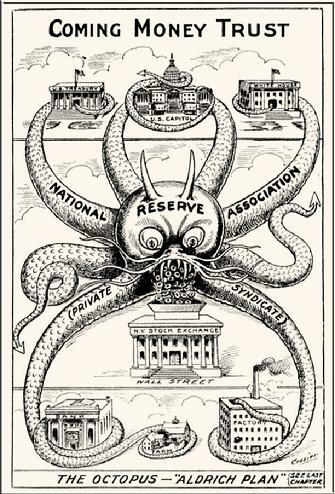 1912 - There was still time to halt the turning over of America to the control of the Federal Reserve Banking Corporation...Some were astute enough to see what was coming ...they issued warnings ... one of which was the poster seen below. It was President Woodrow Wilson himself ... who pushed for the Federal Reserve and signed it into law. Interestingly, one of Wilson's advisors ... Colonel House; later received a letter from President Franklin Delano Roosevelt in 1933 (inaugurated March 4, 1933 & in office from 1933 - 1945) concerning just who was actually in charge in the United States of America. ("Edward M. House" -was not a real colonel, but was the son of then Mayor of Houston, Tx. Roosevelt had been Secretary of the Navy under President Wilson. Beginning with his inauguration address, Roosevelt began blaming the economic crisis on bankers and financiers, the quest for profit, and the self-interest basis of capitalism (sound familiar? The same argument, but also ... the same practices). He even stated, "Faced by failure of credit they have proposed only the lending of more money." that a financial element in the larger centers has owned the Government ever since the days of Andrew Jackson." So, how can you tell who is really trying to get rid of the so-called "Banksters"? Well, Andrew Jackson was giving it a try; he was said to have been assassinated as was another who tried it ... one John Fitzgerald Kennedy. Early in 1907, New York Times Annual Financial Review published Paul Warburg's (a partner of Kuhn, Loeb and Co.) first official reform plan, entitled "A Plan for a Modified Central Bank," in which he outlined remedies that he thought might avert panics. Jacob Schiff, the chief executive officer of Kuhn, Loeb and Co., in a speech to the New York Chamber of Commerce, warned that "unless we have a central bank with adequate control of credit resources, this country is going to undergo the most severe and far reaching money panic in its history." "The Panic of 1907" hit full stride that October. Bankers felt the real problem was that the United States was the last major country without a central bank, which might provide stability and emergency credit in times of financial crisis. While segments of the financial community were worried about the power that had accrued to JP Morgan and other 'financiers', most were more concerned about the general frailty of a vast, decentralized banking system that could not regulate itself without the extraordinary intervention of one man. Financial leaders who advocated a central bank with an elastic currency after the Panic of 1907 include Frank Vanderlip, Myron T. Herrick, William Barret Ridgely, George E. Roberts, Isaac Newton Seligman and Jacob H. Schiff. They stressed the need for an elastic money supply that could expand or contract as needed. After the scare of 1907 the bankers demanded reform; the next year, Congress established a commission of experts to come up with a nonpartisan solution. Rhode Island Senator Nelson Aldrich, the Republican leader in the Senate, ran the Commission personally, with the aid of a team of economists. They went to Europe and were impressed at how well they believed the central banks in Britain and Germany handled the stabilization of the overall economy and the promotion of international trade. Aldrich's investigation led to his plan in 1912 to bring central banking to the United States, with promises of financial stability, expanded international roles, control by impartial experts and no political meddling in finance. Aldrich asserted that a central bank had to be (contradictorily) decentralized somehow, or it would be attacked by local politicians and bankers as had the First and Second Banks of the United States. The Aldrich plan was introduced in 62nd and 63rd Congresses (1912 and 1913) but never gained much traction as the Democrats in 1912 won control of both the House and the Senate as well as the White House. The new President, Woodrow Wilson, then became the principal mover for banking and currency reform in the 63rd Congress, working with the two chairs of the House and Senate Banking and Currency Committees, Rep. Carter Glass of Virginia and Sen. Robert L. Owen of Oklahoma. It was Wilson who insisted that the regional Federal reserve banks be controlled by a central Federal reserve board appointed by the President with the advice and consent of the U.S. Senate. William Jennings Bryan, now Secretary of State, long-time enemy of Wall Street and still a power in the Democratic party, threatened to destroy the bill. Wilson masterfully came up with a compromise plan that pleased bankers and Bryan alike. The Bryanites were happy that Federal Reserve currency became liabilities of the government rather than of private banks—a symbolic change—and by provisions for federal loans to farmers. The Bryanite demand to prohibit interlocking directorates did not pass. Wilson convinced the anti-bank Congressmen that because Federal Reserve notes were obligations of the government, the plan fit their demands. Wilson assured southerners and westerners that the system was decentralized into 12 districts, and thus would weaken New York City's Wall Street influence and strengthen the hinterlands. 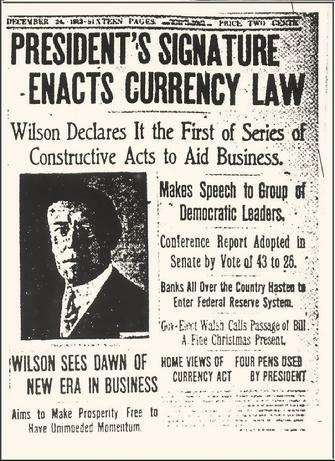 After much debate and many amendments Congress passed the Federal Reserve Act or Glass-Owen Act, as it was sometimes called at the time, in late 1913. President Wilson signed the Act into law on December 23, 1913. Legend of the "Lone Nut"
.... It is a system that has conscripted vast human and material resources into the building of a tightly knit, highly efficient machine that combines military, diplomatic, intelligence, economic, scientific and political operations." [ 1906 ] - "Behind the ostensible government sits enthroned an invisible government owing no allegiance and acknowledging no responsibility to the people. To destroy this invisible government, to befoul the unholy alliance between corrupt business and corrupt politics is the first task of the statesmanship of the day". [ 1924 ] "I am a most unhappy man. I have unwittingly ruined my country. A great industrial nation is controlled by its system of credit. Our system of credit is concentrated. The growth of the nation, therefore, and all our activities are in the hands of a few men. We have come to be one of the worst ruled, one of the most completely controlled and dominated Governments in the civilized world no longer a Government by free opinion, no longer a Government by conviction and the vote of the majority, but a Government by the opinion and duress of a small group of dominant men." The shooter on the Grassy Knoll was caught on film.
" ....In the councils of government, we must guard against the acquisition of unwarranted influence whether sought or unsought by the military-industrial complex the potential for the disastrous rise of misplaced power exists and will persist We must never let the weight of this combination ( military & industry) endanger our liberties and or democratic processes.
" ...In holding scientific research & discovery in respect as we should we must also be alert to the equal & opposite danger that public policy could itself become the captive of a "Scientific-Technological Elite"
President #1: George Washington's Farewell Address: In his speech he warned against the danger of "overgrown military establishments"
Seems there are (or might be) a couple of "warring factions" within the U.S. The Scuttlebutt of the 1960's, had it that one member of one member of the Yankee faction; George Herbert Walker Bush (the elder), wanted to become President of the United States. In 1963 President John F. Kennedy (#35) was assassinated. (Note: Nixon was a mentor/promoter for GHWB who has been quoted as saying he couldn't remember where he was when Kennedy was shot. But then, he also made a strange phone call to say he was available to "help out" ... supposedly from Austin, Texas ... yet; he was seen in Dallas that same day (Day Kennedy was killed). In 1964 Bush began his political rise and became Head of the Republican Party headquartered in Houston. Already, head of Zapata Oil Drilling, he then moved the company from Midland, TX. to Houston, TX. In 1966, Bush's next move was to become a Congressman & was elected to the Texas House of Representatives (representing Houston). Though a first term congressman, he was appointed to the powerful "Ways & Means Committee". In 1971: President Richard M. Nixon (#37) appoints GHWB as ambassador to the United Nations in 1971 after GHWB's failed attempts at getting elected to Senator ... he lost to Lloyd Bentsen. In 1973: Nixon then persuades Bush to again head up the Republican National Committee. Then .. it turns out to be George Herbert Walker Bush that formally asked President Nixon to Resign (after Watergate) "for the good of the Republican Party"; which Nixon did on August 09th, 1974. President #38 Gerald Ford: takes over from impeached President Richard Nixon (#37). Now President Ford was Nixon's vice President. Ford appoints GHWB as liaison to China ... Bush spends the next 14 months in China. CIA: George Herbert Walker Bush gets (GHWB appointed head of CIA by President Ford - 20 Jan 1976. 1977 - President #39 - Jimmy Carter is next up at bat: He replaces President Ford. Carter was inaugurated on 20 Jan 1977 and Bush, now out of a job ... goes into Banking. 1978: Bush became chairman on the Executive Committee of the First International Bank in Houston. Then, also in 1978; the first year it opened, Bush became a part-time professor of Administrative Science at Rice University's Jones School of Business ... BUT: Between 1977 and 1979, he was a director of the Council on Foreign Relations. Bush decides to run for President in the 1980 Election. Ronald Reagan gets to be President #40:. Bush also tried to run, but; lost the nomination to Reagan ... Bush wasn't giving up so easily. Though Reagan was originally against it; Reagan wass "persuaded" to accept Bush as a vice-president. Bush at this point buys his grandfather's estate in Kennebunkport and leaves Houston. The thinking was said to be that Reagan was a "cowboy" and Bush a "Yankee"; thus oil & water, so to speak. But also by combining the two ... the votes would be consolidated. 1989 - President #41 - George Herbert Walker Bush finally get to be President of the United States: Reagan goes on to be stay in office for 2 full terms. Then, his vice-president, George Herbert Walker Bush is elected as President and as Reagan's "successor" ... was inaugurated on 20 Jan 1989. Curiously ... there have been no more "presidential assassinations" or "lone-nut shooters" since Bush the Elder was elected as President....not that is until President Obama takes office. "A New Trend Emerges? ..."
2011 saw the very odd death of a prominent national defense consultant (John P. Wheeler III - age 66). He was last seen alive in downtown Wilmington less than 24 hours before his body was found in a Newark landfill. He had left his office on 28 Dec 2010 & is believed to have been killed on Dec 30th or 31st at latest. He was a former GW Bush official (worked for last 4 years of Bush administration) but also worked for Ronald Reagan & George Herbert Walker Bush (Bush the Elder) His body was found in a Newark dumpster. He had connections to: biological warfare, the Air Force, & Cyber-warfare. Lobbyist Wife found dead - There is also the lobbyist wife found dead in her burning car ... half in and half out of her own garage while her husband & children were at home but "heard nothing". 2011 - January 8th: U.S. Representative Gabrielle Giffords get shot in the face in Tuscon, Arizona. . The shooter (Jared Loughner) had a YouTube channel and the "target" (Gabrielle Giffords) had only 2 YouTube subscriptions ... one of which was to her "shooter"'s channel. Loughner had worked on Giffords' campaign in 2007. He was a liberal who like to read Marx, & listed President Obama as one of his favorite people. 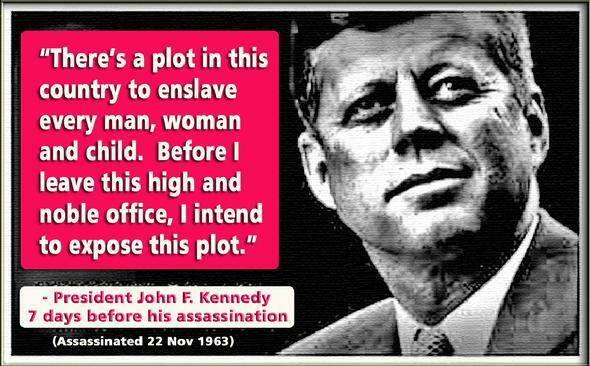 He also believed in government mind control & conscious dreaming. Giffords was for Border / immigration control, gun rights, & was against "Obamacare". Giffords survived but had to resign. Note: The list of mysterious banker deaths (especially in 2014), deaths of scientists, reporter/researcher/authors & documentarians has reached new heights. There has also emerged the "spree shooters" who commit suicide ... a variation on the "lone nut" who in the past limited themselves to only one target. 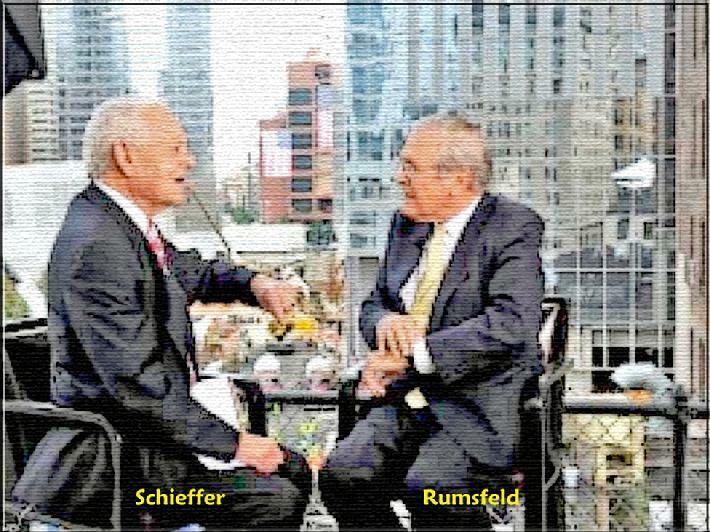 DONALD RUMSFELD to BOB SCHIEFFER:.....the building shook at the Pentagon. And-- and it-- we had been hit and I didn't know if it was a bomb or an airplane or what. So I went out of my office and ran down the hall until the smoke was so bad that you couldn't get any farther and-- and went downstairs and outside and there on the apron outside the Pentagon were the-- were just thousands of pieces of metal. Small pieces. Not big chunks of an airplane. Donald Rumsfeld ... a long time Washington insider & Secretary of Defense at the time ... announces publicly on 10 September 2001 that Trillions of Dollars are missing ... can't be tracked. Yet; two witnesses (Rumsfeld himself on the scene ... in his office at the Pentagon ... & Lt. Robert Medairos, from the Arlington Police - "First Incident Commander at the Scene") see absolutly no plane debris. Lt. Robert Medairos, from the Arlington Police ("First Incident Commander at the Scene") was one of the first to arrive on the scene at the Pentagon, but; did not see any piece of "a plane". The person driving the car that arrived early to the Pentagon, the one that reaches the spot of the supposed "plane impact" .... actually goes over the spot (point of supposed plane impact) but sees no evidence whatsoever of any plane debris. "THE NEW WORLD ORDER ORGANIZATION"
Click Image To Enlarge Chart: Breakdown of the "Committee of 300"
THOSE "NOT SO SECRET ANYMORE"
The Bilderberg Group or Bilderberg conference is an unofficial, annual, invitation-only conference of around 130 guests, most of whom are well known movers & shakers... persons of influence, in the fields of business, media and politics. 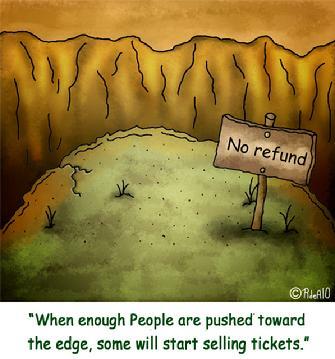 This "elite" group meets annually at exclusive, five-star resorts throughout the world ? normally in Europe ? and once every four years in the United States or Canada. It has an office in Leiden, South Holland, Netherlands. The Hotel de Bilderberg is a hotel in Oosterbeek in the Netherlands where the Bilderberg Group first met in 1954. The hotel gave its name both to the Group and those who participate in its activities called "Bilderbergers". The original Bilderberg conference was held at the Hotel de Bilderberg, near Arnhem, from May 29 to May 31, 1954. The meeting was initiated by several people. Polish emigre and political adviser, Joseph Retinger, concerned about the growth of anti-Americanism in Western Europe, proposed an international conference at which leaders from European countries and the United States would be brought together with the aim of promoting understanding between the cultures of United States of America and Western Europe. Retinger approached Prince Bernhard of the Netherlands, who agreed to promote the idea, together with Belgian Prime Minister Paul Van Zeeland, and the head of Unilever at that time, the Dutchman Paul Rijkens. The guest list was to be drawn up by inviting two attendees from each nation, one each to represent conservative and liberal (both terms used in the American sense) points of view. The success of the meeting led the organizers to arrange an annual conference. A permanent Steering Committee was established, with Retinger appointed as permanent secretary. As well as organizing the conference, the steering committee also maintained a register of attendee names and contact details, with the aim of creating an informal network of individuals who could call upon one another in a private capacity. The declared purpose of the Bilderberg Group was to make a common political line tie between the United States of America and Europe in their opposition to the USSR and the global communist threat to their common monetary interests. Conferences were held in France, Germany, and Denmark over the following three years. In 1957, the first U.S. conference was held in St. Simons, Georgia, with $30,000 from the Ford Foundation. The foundation supplied additional funding of $48,000 in 1959, and $60,000 in 1963. Dutch economist Ernst van der Beugel took over as permanent secretary in 1960, upon the death of Retinger. Prince Bernhard continued to serve as the meeting's chairman until 1976, the year of his involvement in the Lockheed affair. There was no conference that year, but meetings resumed in 1977 under Alec Douglas-Home, the former British Prime Minister. He was followed in turn by Walter Scheel, ex-President of West Germany, Eric Roll, former head of SG Warburg and Lord Carrington, former Secretary-General of NATO. Daniel Estulin, a Madrid-based author, claims that the long-term purpose of Bilderberg is to "Build a One-World Empire". He states the group "is not the end but the means to a future One World Government" whose ultimate goal is to transform Earth into a prison planet "... policed by a United World Army, financially regulated by a World Bank, and populated by a microchipped population whose life's needs have been stripped down to materialism and survival ... work, buy, procreate, & sleep ... all connected to a global computer that monitors our every move." Reporter Jonathan Duffy, writing in BBC News Online Magazine states "In Yugoslavia, leading Serbs have blamed Bilderberg for triggering the war which led to the downfall of Slobodan Milosevic. The Oklahoma City bomber Timothy McVeigh, the London nail-bomber David Copeland and Osama Bin Laden are all said to have bought into the theory that "Bilderberg pulls the strings with which national governments dance." Tony Gosling registered the domain name bilderberg.org, and uses the web site to spread his theory that the group's alleged efforts towards a world government are a sign of a biblically-predicted apocalypse. "EVERYTHING IS IN PLACE AND NO ONE CAN STOP US NOW"
20 Years Later (in the 80's) he transcribed 2 Tapes from that Lecture. As of 2011 (42 years later) it appears that it is all coming to Pass. "They" are the "New World Order"
Agenda: "The New World Order"
Dr. Lawrence Dunegan, a pediatrician, was invited to attend a lecture by a prominent doctor: Richard Day M.D. (back in 1969). According to Dunegan, before the lecture started Dr. Day told the room of about 80-90 doctors all about a series of changes they would witness in their lifetime. Recording devices were not allowed in the room and taking notes of the lecture was prohibited. The speaker ... Dr. Day told the doctors they would be free to speak about his lecture content because everything was in place and nobody could stop them now that the project was underway. BUT: at the end of the talk; Dr. Day gave the room of doctors an hypnotic suggestion to forget everything they heard... but to be ready for the coming changes. According to Dr. Dunegan, after the lecture when he asked some of his friends that were in the room what they thought of the lecture none of them could tell them what it was about! As luck or Fate would have it ... Dr. Dunegan was born with a near photographic memory, and was able to produce notes after he got home from the lecture. Segue to 1989: Those notes stayed in his desk for more then 20 years until he pulled them out and decided to make audio tapes of the information in 1989. Was it a coincidence that the lecturer, Dr. Day, died that same year? Was there some sort of subliminal suggestion that kept that Dr. Dunegan from distributing this information that was somehow lifted upon Dr. Day's death? The recollections of Dr. Lawrence Dunegan regarding a lecture he attended on March 20, 1969 at a meeting of the Pittsburgh Pediatric Society. The lecturer at that gathering of pediatricians (identified in tape three recorded in 1991) was a Dr. Richard Day (who died in 1989). At the time, Dr. Day was Professor of Paediatrics at Mount Sinai Medical School in New York. Previously he had served as Medical Director of Planned Parenthood Federation of America. Tapes 1 & 2: Transcript of two out of three tapes on the "New World System." Tapes one and two were recorded in 1988, tape three in 1991. "New Order of Barbarians" is the recollections of Dr. Lawrence Dunegan of a lecture attended on March 20, 1969 at a meeting of the Pittsburgh Pediatric Society given by one "Dr. Richard Day" who had inside knowledge of...this "New Order of Barbarians"... referred to on the tapes simply as the "New World System." of the young as well as the old. BERTRAND RUSSELL - 1952: "I think the subject which will be of most importance politically is mass psychology. Mass psychology is, scientifically speaking, not a very advanced study. This study is immensely useful to practical men, whether they wish to become rich or to acquire the government. It is, of course, as a science, founded upon individual psychology, but hitherto it has employed rule-of-thumb methods which were based upon a kind of intuitive common sense. Its importance has been enormously increased by the growth of modern methods of propaganda. Of these the most influential is what is called ‘education’. Religion plays a part, though a diminishing one; the Press, the cinema and the radio play an increasing part." SIR JULIAN HUXLEY - 1946: As the first Director of UNESCO (United Nations Educational, Scientific and Cultural Organisation), Sir Julian Sorell Huxley (1887-1975) wrote a paper entitled UNESCO Its Purpose and Its Philosophy (1946) in which he outlined his vision for the newly created international organisation (which grew out of the League of Nations’ Institute of Intellectual Co-operation). According to Huxley, the guiding philosophy of UNESCO should be what he termed, World Evolutionary Humanism. NOTE: Julian Huxley, an evolutionary biologist, humanist, and ardent internationalist held many titles including: Secretary of the Zoological Society of London (1935-42), first president of the British Humanist Association (1963), Vice-President (1937-44) and President (1959-62) of the British Eugenics Society. He was also a founding member of the World Wild Life Fund, coined the term "transhumanism"(as a means of disguising eugenics) and gave two Galton memorial lectures (1936, 1962). Huxley also received many awards including the Darwin Medal of the Royal Society (1956), UNESCO’s Kalinga Prize (1953) and the Special Award of the Lasker Foundation in the category Planned Parenthood - World Population (1959) to name but a few. He is also the Grandson of Thomas Huxley and brother of author Aldous Huxley. "From this global aim, another principle immediately follows. It is that Unesco should devote special attention to the leveling up of educational, scientific and cultural facilities in all backward sectors where these are below the average, whether these be geographical regions, or under-privileged sections of a population. To use another metaphor, it must attempt to let in light on the world’s dark areas. The reason for this is plain. For one thing it will be impossible for humanity to acquire a common outlook if large sections of it are the illiterate inhabitants of a mental world entirely different from that in which a fully educated man can have his being, a world of superstition and petty tribalism in place of one of scientific advance and possible unity. Thus mass campaigns against illiteracy and for a common fundamental education must form part of Unesco’s programme. "Further, a satisfactory common scale of values can obviously not be attained so long as large sections of mankind are preoccupied with the bare material and physiological needs of food, shelter, and health." "On reflection, however, it is speedily seen that a campaign for mere literacy is not enough. It needs to be linked with the general system of education, and, among illiterates above school age, to be coupled with general social education, notably in relation to health, current methods of agriculture, and citizenship. That is why, in Unesco’s programme, literacy campaigns have been merged in a more comprehensive study of Fundamental Education." "To conclude with a more immediate problem, Unesco is proposing to support further study and experiment in regard to the discussion group method. Every extension of democracy, whether political, economic, or cultural, makes it more necessary to have a general awareness among the people at large of the problems, tasks, and possibilities which confront them. The discussion group, properly led and properly serviced by bodies such as the Bureau of Current Affairs, seems to be one of the most fruitful methods to this end, and Unesco must investigate its potentialities in different types of societies and for different special purposes. A converse problem is that of Public Relations, notably in government. These are in modern conditions indispensable agencies of adult education for citizenship. But they can readily degenerate into organs of justification for government departments or ministers, and can equally readily be distorted into mere propaganda organisations. The most careful study of their uses and abuses, their possibilities and limitations, from the joint angle of education and social science, is of great importance and considerable urgency at the present stage in human evolution." "But it would also, we may assume, have to include provision for some new type of higher education for those with quantitatively lower I.Q.s and aptitudes, who yet desire (or are desired by society), to devote some of their post-adolescent period to further education instead of to earning a living. And when the time comes, it will obviously be for Unesco to help in working out the requirements, both in content and methods, of this new type of higher education." "One other item which Unesco should put on its programme as soon as possible is the study of the application of psycho-analysis and other schools of "deep" psychology to education. [...] This would mean an extension of education backwards from the nursery school to the nursery itself." The importance of education, especially of the very young was well emphasized by Lord Bertrand Russell (1872-1970) in his book The Impact of Science on Society (1952) . Russell was a renowned British philosopher and mathematician who was an adamant internationalist and worked extensively on the education of young children. He was the founder of the Pugwash movement which used the spectre of Cold War nuclear annihilation to push for world government. Among many other prizes, Russell was awarded the Nobel Prize in Literature in 1950 and, like Julian Huxley, UNESCO’s Kalinga prize (1957). "What is essential in mass psychology is the art of persuasion. If you compare a speech of Hitler’s with a speech of (say) Edmund Burke, you will see what strides have been made in the art since the eighteenth century. What went wrong formerly was that people had read in books that man is a rational animal, and framed their arguments on this hypothesis. We now know that limelight and a brass band do more to persuade than can be done by the most elegant train of syllogisms. It may be hoped that in time anybody will be able to persuade anybody of anything if he can catch the patient young and is provided by the State with money and equipment." "Although this science will be diligently studied, it will be rigidly confined to the governing class.The populace will not be allowed to know how its convictions were generated. When the technique has been perfected, every government that has been in charge of education for a generation will be able to control its subjects securely without the need of armies or policemen"
More about Bertrand Russell’s views on education can be found in his article entitled: Mass Psychology and Education. Quotes from Julian Huxley, UNESCO Its Purpose and Its Philosophy (1946). Preparatory Commission of the United Nations Educational, Scientific and Cultural Organisation. pdf from UNESCO. AN UNBROKEN LINK & THE RIGHT TO RULE ? The theories point to an unbroken, traceable link from pre-diluvian times, of a stream of knowledge which later became channeled into a Tradition in order to preserve its secrets and allow a small group of Elitists to experience a more advanced or at the least "more privileged" lifestyle at the expense & toil of the "The Masses". So that "we" the taxpayers... end up funding just about everything for these hidden Elites. The Elites lead lives in a world separated from the masses & protected by their vast wealth. Their minions .... (those lower down on the Elite totem pole) get rich by appearing in the public eye & doing the bidding of the source of their "trickle-down wealth & power". Politicians for example, that once in office ... seem to end up millionaires though they have no other job or source of income.... but all of a sudden turn into apparent financial "wunderkins" almost overnight. The "public servants" that are supposed to work for the People .... but instead .... work only to maintain their lucrative & privileged positions along with their apparent "Rule Over the Masses". A FREEMASON "Renaissance" - or: An Egyptian-Sumerian Ruling Class Re-born? Edward Bramley's "Gods of Eden"
Lights In The Jungle ? On trek through the forbidding Matto Grosso region of Brazil in 1925, Colonel P.H. Fawcett, D.S.O., was challenged by native reports of mysterious cold lights in some ruined cities of the jungle. Not only that. There existed, it was claimed, a city still living, inhabited, illuminated at night. Could this really be? Might there be some still surviving remnant of a long lost civilization, which was using "forgotten" knowledge? Fawcett came out swearing he had glimpsed one of these jungle cities. He reentered the region to further pursue his passion, but this time disappeared without trace. Few have ever set foot in this remote area and few have returned. It is a land infested with enormous swamp creatures, wild beasts and even wilder men. This region is generally bounded by the Rio Xingu, the Rio Tapajos and the Amazon. The existence of devices which provided lighting at night in ancient times cannot be questioned, because so many classical writers describe them. Until 1890, man possessed only candles, torches and oil lamps, and it is easy to think that this was always the case. However, the past use of lighting and electricity must be regarded as an historical certainty. In Antioch, Syria, in the 6th century, an ever-burning lamp was found with an inscription indicating it had been burning more than 500 years. And in England, during the early Middle Ages, a third century perpetual lamp was found that had burned for several centuries. In Rome, when the sepulchre of Pallis was opened in 1401,the tomb was found to be illuminated by a perpetual lamp which had been alight for more than 2,000 years. Nothing could put it out, until, in an act of vandalism, it was broken to pieces. 11th century Bysantium historiuan, Kedrenus, records having seen a perpetual lamp at Edessa, which had been burning for 500 years. Location: in the Matto Grosso, near the modern town of Diamantino. According to the reports of several researchers during the early 1970s, an underground city, known by natives of the Ugha Mongulala tribe as Akakor, lies deep within the thick northwestern Brazilian jungle. Unknown machines lie therein, as do lights which never go out. Four human bodies have been seen, lying in a preserving liquid. The spot is considered sacred by the tribe. Rivers—dense and dangerous jungle country. A village in Irian Jaya, near Mt. Wilhelmina, has a layout of artificial illumination that in brightness is said to equal any system we have in the Western world. Travelers who penetrated this hamlet lost amid high mountains, said they ‘were terrified to see many moons suspended in the air and shining with great brightness.” Other visitors have described these “moons” as 10-foot diameter spheres of stone that began to glow with a mysterious bright light as soon as the sun disappeared behind the tangled overgrowth of the jungle. Mounted on tall pillars, they glow with a strange neon-like light, illuminating all the streets. Perpetual lamps are found also in Islamic tradition. The secret was apparently universal. The lamps functioned indefinitely without oil or any product that was burned or consumed. Touching them was prohibited under pain of provoking an explosion capable of destroying an entire town. All those Beautiful Egyptian Murals ... Deep Underground .... but; NO soot on the ceiling from torches. Just What Light did they use to work in total darkness? Maybe they had a Light of Their Own? And, of course .... no way the Pyramids were built with primitive methods & tools. Modern technology can't even build one today. I was surprised to hear from someone, asking about my discovery all these years since the U.S. government came to my site and closed us down, confiscating all that we'd found. To refresh the history; in 1971, I was I was part of an archaeology team from a college in California. A man in southern California discovered a cap stone of sorts underneath about 15 inches of soil on his property. When he had uncovered the stone in its entirety, it measured about 6 feet long by 4 feet wide and weighed about 1900 pounds. He realized that it seemed there was an empty void beneath the stone, but he was unable to lift it. His suspicion was that he had an ancient Indian burial site on his property. He called the college, they sent four other men plus myself to check it out. We got there and came to a strong conclusion that it was indeed an ancient burial site. We arranged with the man, for our archaeology team to come out, lift the stone and check out the site. Three days later, we arrived on site and began. We lifted the stone, and discovered that it covered the entrance to a man made underground complex of 4 rooms with a total area about 35 feet by 50 feet with stone walls, beams, ceiling and floor which had actual rain drainage grooves cut in it which led into an underground stream. The language on the sheets looked familiar, but none of the language experts could decipher them. The best guess was that it may have been a very, very old language. Skeletal remains were about 9 feet in height. We found the skeletal remains of three of these beings. We also found down there, what appeared to be clear plastic cubes, yet when you exposed them to fire they got icy cold and when you placed them in ice water, they would get very hot. One of the team contacted the local police to ask if they could guard the site. The very next day, two U.S. Army officers, a major and a captain arrived with 8 army troops and seized the land from us. Within days, the property was gutted and filled with fresh soil. Overnight, someone broke into our staff office and stole all the pictures and artifacts we'd collected. When I challenged the army officers about what they were doing, the major looked at me and said, “It would be a shame to have to kill you right here and now." Nobody can tell me that the U.S. government is not covering up the fact that thousands of years ago there was a very advanced culture in North America. One of the pictures even showed these men walking among dinosaurs. Seven years ago, I used the Freedom of Information Act and got nowhere. I even gave them the names of the army officers and was told there were never any officers with those names. There is a major cover-up taking place, and it's not just the U.S. government, but; the New World Order covering up these facts. It is disturbing that true science gets muted and stifled by the government. (lamp Info From "Dead Men's Secrets"
"Everybody Wants To Rule This World"
' ...there's a sucker born every minute' "
"Hi, I'm from the New World Order, & I'm Here To Help!" HOW DO YOU "OPT OUT"
OF THE "NEW WORLD ORDER"? VOTING • ISN'T • ENOUGH: WATCH EVERYTHING THAT GOES ON ... ASSEMBLE AT GRASS ROOTS LEVELS TO: BLOCK - IMPEACH - REMOVE: GET ON THE RADIO, INTERNET, NEWSPAPERS & MEETINGS.. inItiate petitions. TRY TO SPOT "RINGERS". ...people who who may " talk the talk"... but don't "walk the walk". People who may state positive sounding goals, but; their means for achieving those goals limit freedom & personal options. When things aren't right; learn to "just say no". DISMANTLE THEIR POWER STRUCTURE .... ONE BRICK (POSITION) AT A TIME. Local political positions of all kinds...no matter how small or apparently "insignificant". Pay attention to judicial appointments and judical rulings. AT THE VOTING BOOTH: VOTE TO REMOVE EXISTING ENTRENCHED CAREER POLITICIANS. INSIST ON TERM LIMITS .... Should Congress Continue To Be The "ELITIST WELFARE PROGRAM" that some have suggested it has become? Check all their Voting Records. Look at what they do ... not what they say! MAKE SURE ITS ALL MADE (Not Just Assembled) IN THE USA - FROM AMERICAN GOODS & SERVICES - WITH AN AMERICAN LABOR FORCE. You can always branch out later if necessary. SOROS: Come to the New World Order ... & be quick about it! Question: How many loaves of Bread will a Gold coin Buy if there aren't any on the shelves? Question: How many gallons of clean water or kilowatts of electric current will a gold bar buy.... if there aren't any? Question: How do you buy gold coins if you don't have a job 'cause they're all Overseas? Question: If all the jobs are government jobs (whether you have one or not; want one or not; will the government pay you in gold? Question: Where are you going to keep all that gold? How do you pay your taxes with gold? IF, you have any left after the "gold tax" kicks in? NOTE: This theory postulates that the death of Seqenenre Tao II ... an egyptian king under the rule of the Hyksos was in fact the last rightful King of Egypt and when he died... so did the secrets of how kingship was to be handed down and maintained on Earth. Secrets that proved that the "king" had access to certain information or "devices" of the gods and thereby had the right & ability to rule over others. The Hyksos king who ruled over Egypt at that time was named Apophis. He and Seqenenre were ingaged in a "war of wills". Apophis wanted the secrets of the Egyptian kings that Seqenenre Tao possessed. Apophis sent spies to learn these secrets and they killed Seqenenre who refused to give them up. His secrets died with him. He was killed while leaving his Noon prayers within the Temple of Amon Re. His story appears in the Bible but is told under another name; that of Hiram Abif (the King or Noble that was Lost) ... the murdered architect of King Solomon's Temple. But the true story of his death along with other secrets was surreptiously kept alive thru the rituals of Freemasonry; though its real meaning was known to only a few. From Egypt ... or; "out of Egypt" also came Abraham whose son Joseph read the Pharaoah's dreams. Abraham came to Egypt at the beginning of the reign of the Hyksos kings... and Joseph (Son of Isaac, the son of Jacob, the son of Abraham) was the vizier to the King of Egypt ... Apophis. The Hebrew or "Habiru" slaves were working (as slaves) in the turquoise mines near Mt. Sinai. They spoke Caananite & worshiped the gods of Egypt. the story of Moses parallels the legend of the birth of Sargon I, King of Babylon & Sumer. Sargon's "changeling mother bore him in secret" and "set him in a basket of rushes" sealed the lid with with bitumen & cast the basket into the River where it floated instead of sinking. Sound familiar? The importance of Moses' story is that with his going to Mt. Sinai ... the "secrets of the gods" lost with Seqenenre's death (that also granted its recipients the right & knowledge & ability to rule over others) were now acquired anew. So Moses brought the Habiru out of slavery in Egypt and into the Sinai Desert to found a new Nation that received the orders of Yahweh and who were, from then, on to worship and serve only their new "God". So this newly acquired mandate from God allowed the founding of a New Nation and the conquering of many people & lands. Moses was succeeded by a line of Judges and eventually Saul anointed David who was made King of Israel to be followed by Solomon. Moses' knowledge & secrets were said to be passed down to the House of David which eventually was to produce Yeshua or: Jesus. so Jesus was the recipient of whatever "secrets of the gods" allowed or permitted Kingship on Earth. Jesus (or his brother James) was therefore "qualified" to be a "King of the Jews". Fast-Forward to the United States of America whose founding fathers were almost all Freemasons. 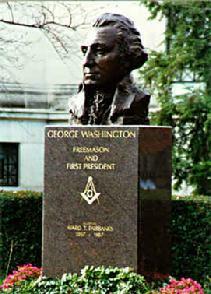 George Washington himself a 33rdº Mason was depicted in full Mason regalia and .... The USA symbols are fraught with Freemasonry Symbology. Christianity also played a large part in the founding of the USA. The Holy Grail, the Ark of the Covenant, The Spear of Destiny, The Sword in the Stone, The Secrets of the Djinn; Once there was a knowledge base (like the Annunaki ME's) and Certain Devices of Great Power or Energy... of Communication & Transport; that enabled certain men to rule on Earth. Their rule was seemingly "decreed by the gods" . The Chinese Emperors (for example) had to have the "Mandate of Heaven" and demonstrate their possession of it thru their being able to predict the future. Hitler wanted that knowledge and those devices. So it all boils down to this: "Who has the secrets & devices of the gods" or "God". And .... whom does this knowledge now serve?